Provide a fantastic support for an existing bird house or feeder with this Erva Deluxe Birding Pole with Ground Sleeve and Mounting Adapter. This package enables you to perfectly situate a bluebird house or wooden feeder in your garden, thanks to its included mounting bracket and hardy steel construction. The three, tubular steel pole sections attach together in moments with swaged ends, and the black, powder coated finish keeps them protected from the elements. Once assembled, these sections form a generous, 80" tall pole, and the included, 12" long ground sleeve helps the unit remain stable in your yard. The versatile mounting adapter attaches to the top of the pole, and sports a 2.25" long and 2" wide plate with predrilled holes on both its top and one side. This clever design allows you to affix this bracket either to the base or back of your birding accent, and a thumbscrew keeps the adapter secure on the pole. Each piece is crafted from lasting steel, and the black, powder coated finish ensures longevity. 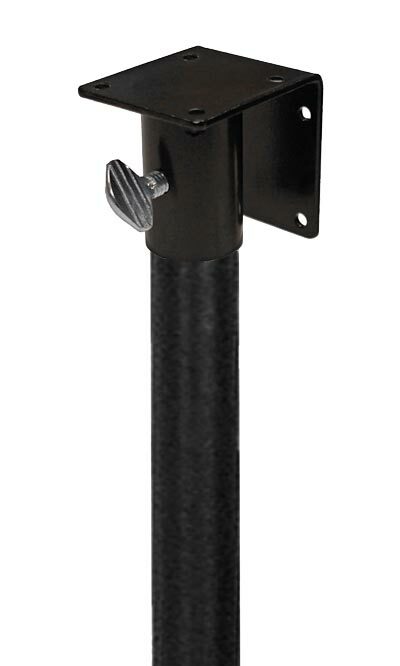 Display a birding item in your garden from this Deluxe Birding Pole with Ground Sleeve and Mounting Adapter. Assembly required. Made in the USA.